Sun safety is one of the most important skincare lessons you can teach yourself, primarily because it will help you understand how to prevent skin cancer. Adopt healthy habits to decrease your chances of developing the disease. According to the American Cancer Society, prevention and early detection of skin cancer are critical. The disease can afflict anyone, so it is important to be vigilant even if your chances of acquiring the disease are statistically low. There are a number of ways to prevent skin cancer, and they all start at home. In other words, these are things you must proactively do to protect your skin. While it can be a challenge for the avid sunbather, it's well worth the effort and high quality of life and good health. Reduce your exposure to sunlight. This is essential! The sun's UV rays are strongest between the hours of 11 am and 4 pm. Limit your time outdoors during these hours. When you are headed outside, apply sunscreen. The right amount for your body is roughly shot glass size. For best results, apply it at least half an hour before going outside and reapply every two hours (or more often if you're spending time in the pool or ocean). Choose a sunscreen with a high sun protection factor (SPF). The best is one that offers broad-spectrum protection from both UVA and UVB rays, like the highly regarded La Roche Posay Anthelios. Don't forget to apply sunscreen to those oft-neglected areas, like the ears, neck, hands and feet. Don't limit sunscreen to beach and pool time. Wear a moisturizer or makeup that contains sunscreen every day, such as Mary Kay Tinted Moisturizer with broad spectrum SPF 20. Keep your skin covered as practically as possible when the sun is out. Of course, this is easier said than done in the summertime, but choose lightweight garments that cover your arms and legs if possible. Don't forget to wear a hat with a wide brim to protect your face. Protect your children, as these formative years are the most important in preventing the development of skin cancer later in life. 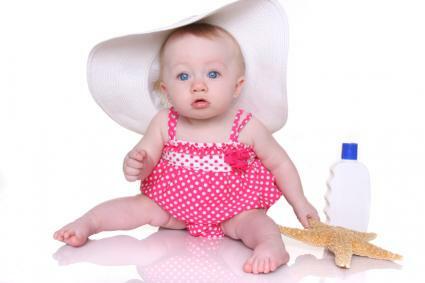 Keep babies under one year of age away from direct sunlight completely. Follow Centers for Disease Control (CDC) recommendations for protecting children from the harmful effects of sun exposure. Finally, conduct routine spot checks of your skin to detect any skin cancer warning signs. Examine existing moles for any changes, such as discoloration, bleeding or a difference in appearance. Also watch for signs of new growths or sores that do not appear to heal. Those spending a great deal of time outdoors automatically have a higher chance of developing the disease, as do individuals who live in areas where the sunlight is strongest. As an illustration, SkincarePrevention.org points out that Australia, where sunlight is quite bright all year, is home to the highest rate of skin cancer in the world. Exposure to harmful UV rays doesn't necessarily come solely from spending time in the sunlight. Skincare.org warns against the usage of tanning salons and sun lamps. They may leave your skin with a golden glow, but they do so by emitting UV rays. Often, the rays are up to five times as strong as natural sunlight. Not only do you risk severe burns and premature aging, you increase your chances of developing skin cancer. UV exposure is not the only possible cause of skin cancer. According to the Mayo Clinic, individuals with a family history or individual history of skin cancer can have an elevated risk of developing the disease over time. Individuals with fair skin are more susceptible to the disease than those with dark skin. However, though the incidence rate is lower, individuals with dark skin are not immune to the condition. Those who have compromised immune systems or who have been exposed to radiation or arsenic are also at an elevate risk. At the center of it all are ultraviolet (UV) rays, the harmful (yet invisible) light that damages skin over time. Two types of rays in particular - UVA and UVB - are responsible for doing the most damage. According to the Stanford Medicine Cancer Institute, both UVB and UVA rays are bad for your skin and are linked to skin cancer. UVB rays are more directly related to skin cancer risk than UVA. Exposure to UVA rays increases the potentially damaging effects of UVB, resulting in an increased risk of skin cancer, as well as cataracts. UVA rays are also associated with the outward signs of aging, including wrinkles and a reduction of skin elasticity. While most people lay out in the sun to catch a few rays and darken their skin's tone, they are actually doing damage. A suntan is, quite literally, a burn that occurs when the skin creates excess melanin to protect it from those dangerous UV rays. There is no such thing as a "healthy" tan; the change in skin tone occurs in response to a potential threat from the sun. Though every point noted is essential in preventing skin cancer, possibly the most important of all is simply to wear sunscreen. It is not practical to avoid sunlight completely - nor is it actually necessary to do that. However, if you're avid sunbather, now is the time to start rethinking your habits and making a change for the better. It's worth it. It's also important to be vigilant in seeking medical attention at the first potential warning signs of skin cancer. Do not delay having any suspicious areas on your skin checked out by a medical professional.